PrivateVPN is a very established VPN service. 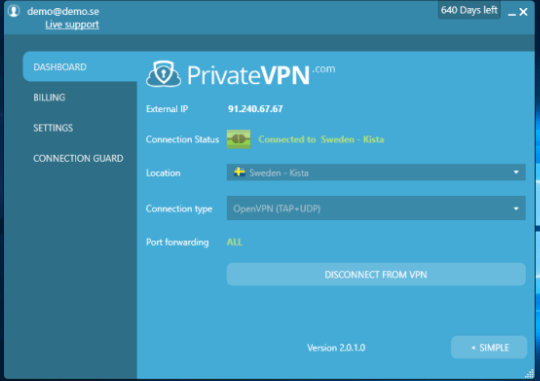 PrivateVPN is one of the most established VPN service providers in Sweden. From an overall perspective, PrivateVPN is definitely a secure VPN service. It has a decent VPN client and the company allows users to connect up to six simultaneous devices with just one account. PrivateVPN has a strict zero logs policy and offers servers in over 43 countries all over the world. Some of the other Elite VPN service providers do offer more in terms of number but you’re going to have to read the full PrivateVPN review to find out if they can match PrivateVPN in terms of quality. For now, know that PrivateVPN doesn’t just offer VPN servers. It offers them in strategically placed locations which are extremely useful. They are useful in the sense that they allow users to have as many opportunities as they are ever going to get to bypass geo-restrictions for any website in the world. The official PrivateVPN website is built professional and the content present there is also very informative. Unlike some of the other VPN service providers out there in the market, PrivateVPN doesn’t boast about any unbelievable claims. It doesn’t say it is the best. And it doesn’t say it is the fastest VPN alive (if that makes sense). Instead, the company has left that judgment to its customers. Besides, it is just so refreshing to see a VPN service breaking away from the pack and not doing, claiming, what everybody else is claiming. A lot of VPN service providers straight up lie about their actual privacy documents and don’t have as fast VPN servers as their official website’s say so. 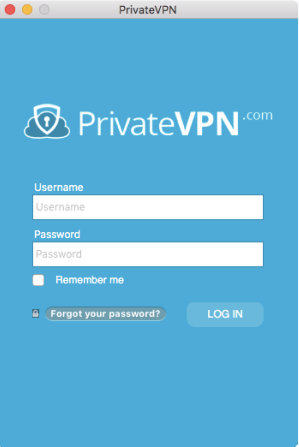 PrivateVPN also has an in-house VPN client and it is available on all major platforms. The company does make a rather bold claim that it has an uptime percentage of 98.8 percent. As high as that might sound, it is actually on the lower side because some of the other VPN service providers claim to have 99 percent uptime. Again, we can put that down to Private VPN’s honesty rather than mediocrity. Each package comes with a seven-day money-back guarantee and the company provides all its customers with 24 hours customer support. As you can probably imagine, PrivateVPN offers a lot of features and that’s why we think PrivateVPN has a bright future. But what’s the current state of affairs? PrivateVPN follows the age-old formulae of the VPN industry and offers three types of plans. Each VPN plan caters to a different type of user. Of course, that is good. Before we get to the actual pricing, we would like you to know that PrivateVPN isn’t expensive. In fact, we think it is rather cheap when users sign up with the company for longer periods of time. In other words, the company rewards people who show it some customer loyalty. The cheapest of all packages comes at around $6.71 per month and the subscription lasts for precisely one month. This price drops to around $5.49 if the user signs up with PrivateVPN for a period of three months. Of course, the best value package is the one that lasts for a year. For a 12-month package, the user only has to pay $52.55 per year. On conversion, that comes down to around $4.46 per month. There is another huge plus though. PrivateVPN comes with a long seven-day money-back guarantee for all users. We don’t know of too many VPN service providers who provide such a long money back guarantee. OF course, subscribers of PrivateVPN will have to pay the subscription fee first. The money-back guarantee basically means that if after one month you are not satisfied with PrivateVPN service, you can ask for your money back and the company will comply no questions asked. In other words, your purchase of PrivateVPN is risk-free. If you contact PrivateVPN representatives, they may just give you a special code. You can then use this special code to use PrivateVPN for free for 24 hours. Remember, you heard it first here, on www.topvpnsoftware.com. All PrivateVPN subscribers can connect up to six simultaneous devices per account. The number six is genuinely excellent. There are very few VPN service providers who provide more in terms of number of simultaneously connected devices. If you have a large family or just want to buy with friends then PrivateVPN is a great choice. It is also a great choice because it works with devices such as smartphones, laptops, tablets. You can use it at work or at home. PrivateVPN will protect you in your home network as well as when you’re connected to a public Wifi network. The PrivateVPN application is extremely well designed. It is well designed because it has a lot of features. One of those features is the kill switch. The kill switch basically disconnects your protected device from the internet connection as soon as the VPN connection becomes unstable or is dropped. This feature allows subscribers to know for sure that there never will come a time when they will accidentally compromise their online traffic to their internet service providers. Moreover, the PrivateVPN app allows users to select software application which the kill switch should “kill”, once the VPN connection is dropped. Do take note that even though a precise by-the-app kill switch is really neat, it cannot make up for a good firewall kill switch. In other words, it isn’t as secure as kill switches which are based on firewalls. Firewall-based kill switches block Internet traffic outside the VPN connection as well. PrivateVPN also supports port forwarding. You’re going to have to visit the official website to know which VPN servers are eligible for this feature. You can also contact PrivateVPN representatives directly and ask them which server have this feature for your preferred device. PrivateVPN also has, what the company calls, high-quality VPN servers. According to official sources, the company wants to buy internet capacity straight from the IP transit provider. In other words, these high-quality VPN servers as basically tier-1 servers. There are no middlemen in the network when it comes to high-quality VPN servers. Hence, high-quality VPN servers allow PrivateVPN to offer better VPN connection speeds. Head on over to the speed section of this PrivateVPN review for more details. Do You Want To Have Remote Control? Then PrivateVPN will fit you just fine. Because for all the folks who don’t want to go anywhere near technology, PrivateVPN has a remote installation feature. If a user implements this feature, then a PrivateVPN representative will remotely take control of the user’s computer and then help the user to install the VPN service. But, if you’re reading this review then there is a good chance that you don’t need someone’s help to set up a VPN service. Besides, the installation process is easy as a pie. Regardless, this feature is a welcome addition for those people who know very little about technology and computers. And of course, it never hurts to list more features than your competitors no matter how useless they are. A remote feature is also available for users who want general maintenance. In this case, the company representative will use a software like TeamViewer to provide software support. Believe it or not but PrivateVPN also has a guide on how to set up the remote control service for your machine. PrivateVPN is based in Sweden. This is something we mentioned at the top as well. Because Sweden has some really strict data retention laws. Well, the parliament in Sweden passed a horrendous law in 2008 which allowed the government there to monitor all online traffic and do so without the need of any warrant. Sympathizers of the law say that the government did it to protect national security. Fortunately for privacy-conscious people, the government updated the FRA law in 2009. The updated law allowed for more political oversight. In 2010 however, media reports revealed that the law could not be implemented. Because of some unknown technical difficulties. Some believe that the government set up an intelligence agency instead and now that agency would monitor all online traffic. Moreover, some experts believe that the “agency” is more likely to be still operating but without any supervision. Moving back in time for a second again, we should perhaps mention that in 2009 the Swedish government passed another law. This law dealt with copyright issues and the government aptly named it the anti-copyright privacy law. How does IPRED affect the end-user? Well, IPRED allows copyright holder groups to ask ISPs based in Sweden to hand over personal information of its customers if they are under the suspicion of sharing copyrighted content. Of course, copyright holder groups will require a warrant to issue a request. As a result of IPRED, many people in Sweden started to sign up for VPN services. Some of them subscribed to PrivateVPN as well. Fast forward from our past point to another past point in 2012 and we have the Swedish government passing a mandatory data retention law. This law forced ISPs to maintain a record of all data transferred through its service for a period of six months. What does this record contain? In the year 2014, the European Court of Justice, ECJ, ruled mandatory data retention laws as illegal because of violations of human rights. In 2016, the European Court of Justice declared surveillance without supervision as unlawful. The ruling didn’t change much. But it did open the possibility that one day people and politicians could overturn these mandatory data retention laws. What About PrivateVPN Log Policy? If you read the previous section you would know that Sweden is not a great place for a VPN service provider. Needless to say, even if a VPN service like PrivateVPN monitored its users and kept a log on them then one should stay away from them. Except that PrivateVPN does not keep any logs. According to official sources, the company doesn’t keep any user logs no matter what the form. How does that benefit the user? If Swedish investigative authorities come to PrivateVPN and ask for user information then the VPN company couldn’t possibly comply with their demands because it doesn’t keep user logs. And since it doesn’t know what its users do, it can’t really cooperate with government authorities. Remember, laws like IPRED did not apply to VPN services. It is only aimed at ISPs. But those data retention laws do apply. PrivateVPN representatives would gladly tell you that they are handling the pressure of giving up user details very well solely because of the fact that they don’t have any information on their subscribers. 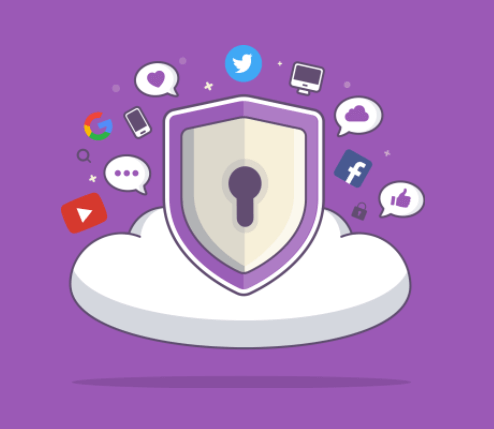 According to official sources, the company maintains a hundred percent success rate when it comes to protecting user privacy. In other words, you are safe if you use PrivateVPN on your machine. It does not share data with any third party companies and of course, it gets bonus points for that. The only problem is its country of operation. As mentioned at the top of this review as well, PrivateVPN offers VPN servers in 29 countries. If you want to use VPN servers that are located in the above-mentioned regions then you should look somewhere else for your VPN needs. As far as VPN protocols are concerned, PrivateVPN offers the most secure and widely used one which is OpenVPN. OpenVPN is a secure VPN protocol and always gets our recommendation at topvpnsoftware.com. Yes, that is a huge array of choice and you can check out all of them via PrivateVPN purpose-built VPN app toggling features. By default, PrivateVPN uses OpenVPN for its VPN connections. But not in a conventional way. OpenVPN works a bit differently when it is implemented for TUN and TAP. Beginner users should use TAP because it helps in streaming content from the internet. It uses the standard AES-256 bit cipher for the control channel. Furthermore, it uses a Blowfish-128 bit cipher for the data channel. Both channels get an RSA-2048 bit handshake. HMAC SHA1 data authentication is also used. You may consider Blowfish-128 bit a bit weak. Because it is layered by the control channel AES-256 bit encryption. If a hacker wants to hack you, he/she will first have to break the AES-256 bit control channel encryption before breaking the Blowfish-128 bit encryption for the data channel. In other words, PrivateVPN uses strong implementations of encryption technologies. PrivateVPN VPN application offers other encryption protocols as well. PPTP. But is is not as secure as OpenVPN when it comes to user privacy. There is no built-in DNS leak protection in PrivateVPN applications. But the PrivateVPN VPN app does manage DNS request through the company’s own servers. If you want to set up something similar then you will need to tinker with the application’s DNS settings manually. And it’s not difficult to do so. You can easily get it done via some PrivateVPN guides on the company’s official website. And besides, you have the customer support to ask for help, don’t you? They will walk you through the whole process. What About The Official Website? Official websites are important because that’s the only change VPN service providers get to make a mark on their potential customers. PrivateVPN official website is neat, to say the least. It has a lush purple theme which is really smooth for the eyes. Moreover, the website is designed in a such a way that the more you use it, the more it impresses you. As mentioned before, there are no unbelievable claims made on the website. The information is laid out in an organized manner. PrivateVPN doesn’t hide the nitty-gritty details about its encryption technologies. You can find more information about its encryption technologies on the feature list page. Needless to say, this is a rarity in this business because most VPN service providers don’t want to divulge on their encryption technologies. Any important information that you may feel like PrivateVPN should be giving, is usually accessible within a click or two. This marks PrivateVPN as a serious VPN service provider. There is also a dedicated support section on the official website and it is neatly filled out with setup guides. 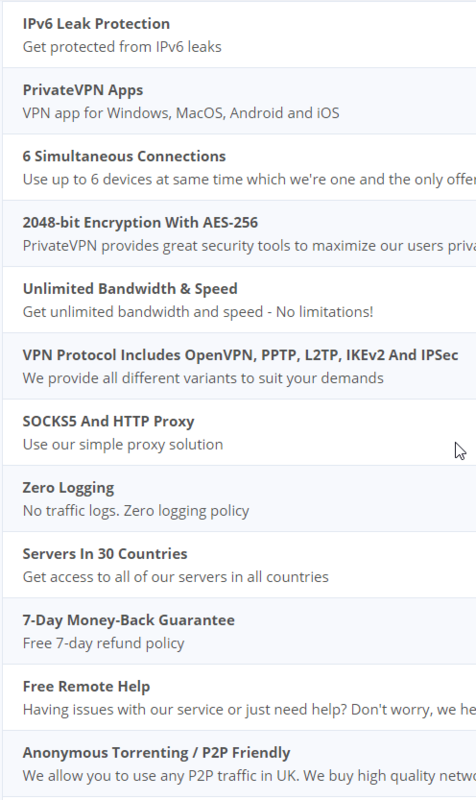 Everything that you could ever want to set up with a VPN service is present on PrivateVPN’s support page. PrivateVPN provides guides for all VPN protocols and all major operating systems. The guides themselves are clear, comprehensive and filled with screenshots. It doesn’t matter if you want to use SSTP or OpenVPN on Windows, Linux, Android or even iOS, PrivateVPN has a guide for it on its official website. PrivateVPN also has guides for users who want to install VPN software on their DD-WRT and other types of routers (like Tomato routers). In short, we recommend all users to at least scan over PrivateVPN setup guides. They are that good. There is also a FAQ section that answers common user queries. Along with the FAQ section, there is also a PrivateVPN flag that notifies users whenever there are any upgrade news and other VPN related news. The blog has three sections. All sections have useful posts and it looks like PrivateVPN has professionals working on its official blog. A blog is a terrific way of communicating with the customers and PrivateVPN realizes that. All PrivateVPN subscribers should regularly check out PrivateVPN blog to stay on top of things. PrivateVPN has a 24-hour customer support system. The company achieves this via email support and a live chat feature. Though our research for this PrivateVPN review tells us that the live chat feature isn’t available on the weekends. Expect the live chat feature to give you prompt answers when it available. We suspect that PrivateVPN has support staff working around the clock but not necessarily 24 hours every day. To be on the safe side, you should try to contact PrivateVPN via live chat during weekdays and during daylight hours. If you don’t have the time for that then shoot them an email anytime you want and expect a response within a day. To begin talking about the installation process let’s start with the signup process. PrivateVPN doesn’t lag behind its competitors when it comes to the signup process. To put it another way, the signup process is as easy as you’d like. People who want to have the maximum amount of privacy should go with Bitcoins as their paying method. Bitcoin increase privacy levels and anonymity without any additional cost or effort. PrivateVPN doesn’t want a lot of details from users who want to use its service. The only thing it requires from the user is a valid email address. As mentioned before, the company does not keep any logs and hence no user is connected to the payment made to PrivateVPN via his/her IP address. Subscribers don’t have to think much when they are using PrivateVPN VPN app. The software is extremely user-friendly and looks nice. All versions of the app are professionally built. By that, we mean the Windows and Android VPN clients. The VPN app offers a ton of options as far VPN encryption protocols are concerned. It has fantastic privacy features which ensure that user privacy is kept safe under any and all circumstances. The Windows client is also very easy to use even though it has a lot of features in it. Users can toggle most of the features including protocol options with the help of a simple toggle button. As mentioned before, PrivateVPN apps don’t protect users against DNS leaks by default. But you can change the settings to make it otherwise. In other words, you need to configure your DNS address manually. But don’t get discouraged since it is a painless process. Of course, you can always go back to the official PrivateVPN website and take advantage of the remote control feature so that one of the company’s representatives can help you set it up. This feature protects the user by blocking online traffic entering or exiting the user’s machine when the user’s VPN connection is unstable. Moreover, the kill switch features allow users to choose specific pieces of software applications that they want to be disconnected whenever their VPN connection is down. Such granular control is a welcome addition. 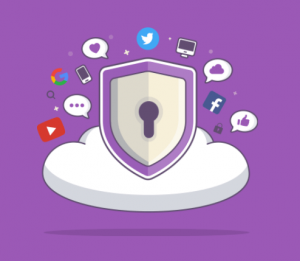 Generally speaking, the PrivateVPN client is an excellent piece of software and can hold its own against any other VPN client. Its functionality and ease of use really puts it above the average VPN service provider and perhaps even some of the elite VPN service providers. 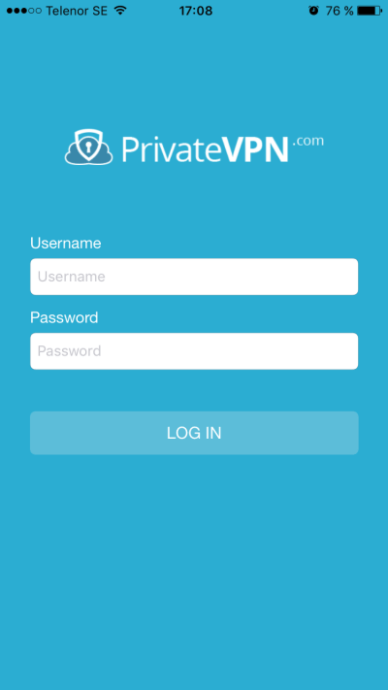 The PrivateVPN app also has an auto-connect feature which will connect to the VPN app once the user’s VPN connection has become stable after the kill switch feature has disconnected the user from the internet. Not everyone uses a Mac but nevertheless, PrivateVPN offers a VPN client for its OS in any case. The VPN app for the Mac OS X is pretty similar to the one that you see in its Windows and Android version. As mentioned before, there are specific setup guides to set up iOS and Mac clients correctly and you can access them via the official website. All PrivateVPN VPN apps are designed professionally and you can count on them to keep you safe when your ISPs come knocking on your door. If you want to make PrivateVPN work with platforms such as Linux then you’re going to have to use other third party OpenVPN applications. Again, PrivateVPN has guides for that too. You’ll have to visit its official website though. The process basically involves the user inputting some command line instructions via the terminal. If you’re using Linux, you need to make sure you have curl installed and working on your machine. But Linux isn’t the only operating system that PrivateVPN has guides on. You can find detailed guides on every operating system that is currently available in the market. Non-technical people don’t have to go anyplace else to get their VPN connections working and in normal order. Want to set up VPN on your router? PrivateVPN has a guide for that. Your device doesn’t matter when you sign up for PrivateVPN. IN other words, it supports all major devices. And perhaps PrivateVPN has to do that because it allows users to connect up to six simultaneous devices and of course, all of them can’t be desktop Windows machines. Users can install the PrivateVPN Android app on their Android smartphones if they have Android 4.0.3 or above running on their devices. They can download the PrivateVPN app from the official Google Play store. PrivateVPN even has a .apk file if a user wants to download the VPN app from the official website instead of the Google Play Store where you need to provide some additional information about yourself. PrivateVPN launched its Android app in the beginning of 2017 so it is pretty new. Before users had to use a third-party OpenVPN client which obviously isn’t as great as a dedicated app. The Android app, just like the desktop app, is very user-friendly and works without any flaws. It also protects users against DNS leaks by default. Your VPN speed really depends on the speed of your internet connection. If you have a fast internet connection (above 50 Mbps) and a fiber connection then expect any VPN service to perform well. Usually, you should perform tests by connecting to OpenVPN over UDP protocol and the Windows client for testing a VPN service out. But of course, you may have your own preferences set already. After that, you should record the highest speed, the lowest speed and the average speeds for a variety of VPN servers and locations. This is the best way to measure true speed. From our research for this PrivateVPN review, we know that PrivateVPN is a fast VPN service. By that, we mean that it perform above average. It is not the fastest VPN service in the world (neither it claims to be) but is far from being slow. PrivateVPN protects users from all DNS and WebRTC leaks. This is, of course, great news for all PrivateVPN subscribers. As mentioned before, the PrivateVPN desktop app doesn’t have built-in protection for DNS leaks. You must update your DNS settings manually. But our research shows that even if you don’t you may still not experience any DNS leaks. As far as streaming goes, expect PrivateVPN to let you stream all the content you want without any buffering. Does It Work With Netflix? It also works with BBC iPlayer. PrivateVPN is an excellent VPN service provider if you want to use VPN for streaming purposes. PrivateVPN isn’t a new player in the industry. It has some good experience behind its back and that’s what makes it one of the best VPN services in the market today. All subscribers get exclusive access to high-quality tier 1 network of VPN servers which are located in great locations. Moreover, all its servers offer tremendous speed with very rare drops in downloading speeds. As far as user privacy is concerned, there are hardly any VPN service providers which are better than PrivateVPN. The company has a zero log policy and backs that up with strong encryption technologies to make sure no one can hurt its customers. PrivateVPN apps allow users to switch between UDP and TCP VPN protocols which are of course fantastic. It also offers bonus features such as port forwarding along with SOCKS5 and HTTP Proxy. Users who want more advanced features can keep themselves busy with features like Killswitch and auto-reconnect. The only downside to using PrivateVPN apps is its lack of DNS leak protection by default. You can still have DNS leak protection by manually changing your configuration but still, it is a drawback. Of course, some users won’t want that kind of a security and hence not consider this a drawback at all. PrivateVPN has VPN servers which are located in the most useful locations around the world and that alone makes this VPN service worth the money. If you sign up for a year then you can avail huge discounts. Besides, you can always take advantage of its seven-day money-back guarantee and hence try out the service without any risk.